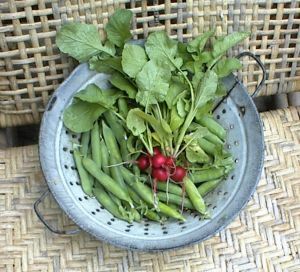 Today’s harvest is radishes and peas. And spinach, but I ate that before I took this picture! I love to eat these peas raw. I don’t grow enough to have for a whole pot, just enough in waves so that I can have snacks in the garden as I work. Why did I ever cook peas, I wonder? 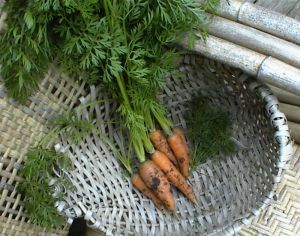 The dirt proves the carrots were freshly pulled out of my garden! There’s also freshly picked dill in that basket for some cottage cheese dill bread tomorrow. This is in the bamboo chair that I’m so crazy about.